Welcome! The Wellington Windsurfing Association (WWA) is a voluntary, non-profit organisation run by windsurfers for windsurfers. 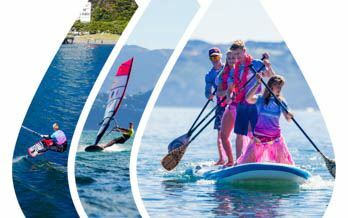 Waterbourne is New Zealand's premier extreme water sports event bringing kitesurfing, windsurfing and stand up paddleboarding together at one ideal location. With a live music and performances, Waterbourne is the place to be this March. Waterbourne is all about participation. No matter what you level of sailing, there's something for you. There are classes for the serious sailors, as well as social classes for those less competitive. The long distance event will have the same format as the old Harbour Blast, and the Ninja games are for everyone. Water activities finish each day at 4pm, which allows the beach party to start. With a family friendly environment and world class performers, everyone can enjoy the entertainment after a fun day on the water. Find out more about the events and news via the Facebook page Waterbourne event.